Finding the right bed frame is important, yet choosing a double bed frame can be a fine art, especially when you’re trying to blend it in with your existing decor. Whether you’re a traditionalist looking for a double bed with a beautiful wooden slatted or spindle headboard or a fabric aficionado lusting after the right combination of colour and texture, we have found the best double beds around. When you're done browsing, check out our guide to buying a bed to ensure you're making the right choice. Sitting slap-bang in between a single bed and a king-sized bed, a double bed is the ideal solution for single sleepers craving for more room and couples who don’t quite have the space for anything bigger. There’s often a lot more choice when it comes to choosing a frame for double beds, with its W135cm x L190cm mattress sizing giving designers more scope to come up with something extra special. Double bed frames come in various different shapes, with footed and unfooted bases, solid or slatted headboards and open, solid or sleigh styles being the most common stylistic variations. Those who want their bed to be a dramatic centerpiece may want to take a look at our top pick, which features a dark wood finish and sleigh-like design, while those who sleep in bedrooms with limited light may want to go for an open bed with a slatted headboard, as they allow for natural light flow and give the illusion of more space – see more headboards to inspire your choice. Those who are desperate for more bedroom storage space may want to consider a bed with storage. We’ve scoured our favourite retailers to bring you the best double beds. Featuring a range of products from the likes of John Lewis, unique items from Made and faithfuls from Furniture Village, you can rely on our list for inspiration, and sleep easy knowing that choosing your next double bed is sorted. Made from solid dark Hevea wood, this is the frame you need if you are looking for a bed to take centre stage in a traditional bedroom. With details including a scrolled headboard and footboard, rich beading detailing and bracket feet, this French-inspired bed is fit for Le Roi himself. Those looking to completely redecorate will be pleased to learn that there’s a range of matching furniture, however due to its solid sleigh style design and dark wood finish, those with dark or small bedrooms may find this bed frame (and its matching furniture) too imposing. Oak is a people pleaser. Being mid-toned, it’s suitable for rooms that may not receive as much natural light as others, and it’s durable so it’s well worth spending that bit extra on it over pine. This oak and oak veneer bed frame is solid without being imposing, and features a slatted headboard for natural flow of light. With two drawers either side of the bed, you have somewhere out of the way to store content from overflowing cupboards. This bed, too, pairs with a range of matching furniture, so giving your bedroom a refresh has never been easier. Subtly decorative, this French-inspired bed features plenty of elegant detail to give your French-inspired bedroom a traditional edge. With a silver, slimline silver oak wooden frame, this bed is decorative without being intrusive, and thanks to the colouring of the wood, it’ll help to create the illusion of light – great if your bedroom doesn’t receive much natural sunlight. The upholstered headboard provides a comfortable surface on which to lean back while reading a book, and with a range of matching furniture available, creating your ideal bedroom should be straightforward. Simple yet elegant, this double bed frame is certainly an all-rounder. Its appearance is very traditional, yet it plays with angles and shapes to give it a completely modern twist. This frame itself is very minimalist, and with its light, reflective copper colouring, should give the illusion of more space and light. The only downside to this bed frame is the metal headrest, which will require strategic positioning of pillows to provide any level of comfort. Opulence doesn’t have to be in the form of a dark wood sleigh bed. If you prefer the idea of an upholstered bed frame, this dark grey, velvet number from Furniture Village could be a great alternative. As a statement piece with a deeply button headboard and footboard with vertical fluting, this bed frame needs to take centre stage, with larger rooms benefiting from its luxurious appearance. 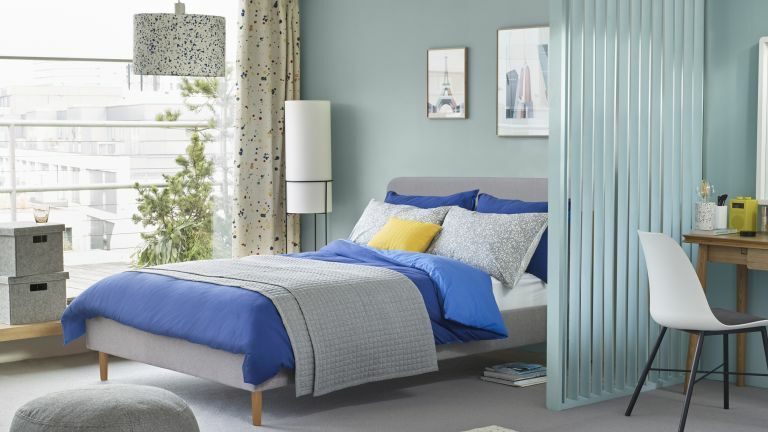 Featuring well-sprung slats, Furniture Village promise that this bed will provide you with a comfortable night’s sleep – so for under £1,000, you can’t really go wrong. While it’s easy for a wooden bed frame to adopt a straight laced, regimented appearance, this number from Ercol has been given plenty of character and charm to make it a great addition to any bedroom. Made from quality light oak with matching grains and textures, this bed emanates quality and superior design. Part of the charm is its shapely spindle headboard, although some people may find they prefer slats rather over thinner bars. There’s also a range of matching furniture to give your room a Scandi-esque appearance. Love a forgiving mattress? Why not buy a memory foam topper?